Acanthis flammea Linnaeus, 1758. Three subspecies are recognized. English: Redpoll; French: Sizerin flammé; German: Birkenzeisig; Spanish: Pardillo Sizerin. The common redpoll is about 4.7-5.5 in (12-14 cm) in body length and weighs about 0.5 oz (14 g). The tail is forked and the beak is sharply pointed and has a black tip. The overall body coloration is gray-brown, with gray wings having light wing-bars, a lighter belly streaked with brown, a red crown on the top of the head, and a black patch beneath the lower mandible. The male has orange-red on the face and chest, but the extent of this varies among geographical races of this widespread species. 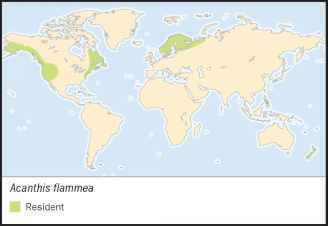 The common redpoll is a very wide-ranging species with a cir-cumboreal distribution, occurring in suitable habitat in northern North America as well as in Eurasia. It occurs in Newfoundland, northern Quebec and Labrador, across the rest of northern Canada to Alaska, and through Siberia and northern Russia to northern Europe and Iceland. It is an irregular migrant that may occur as far south in the United States as California, Oklahoma, and the Carolinas, and also through much of southern Europe, Russia, the Caucasus, and central China. It was introduced to New Zealand in the nineteenth century, where it persists as a non-native songbird. The common redpoll breeds in shrubby tundra, and in the winter occurs in brushy pastures, open forest and thickets, and weedy fields. During the winter they may sleep in snow tunnels to keep warm. They are able to hang upside down chickadeelike to pry birch seeds from hanging catkins. South of the boreal tree-line, the local wanderings and population densities of common redpolls depends on how abundant their winter food is. Common redpolls are active and mobile birds. Even at rest, much fidgeting and twittering is evident. 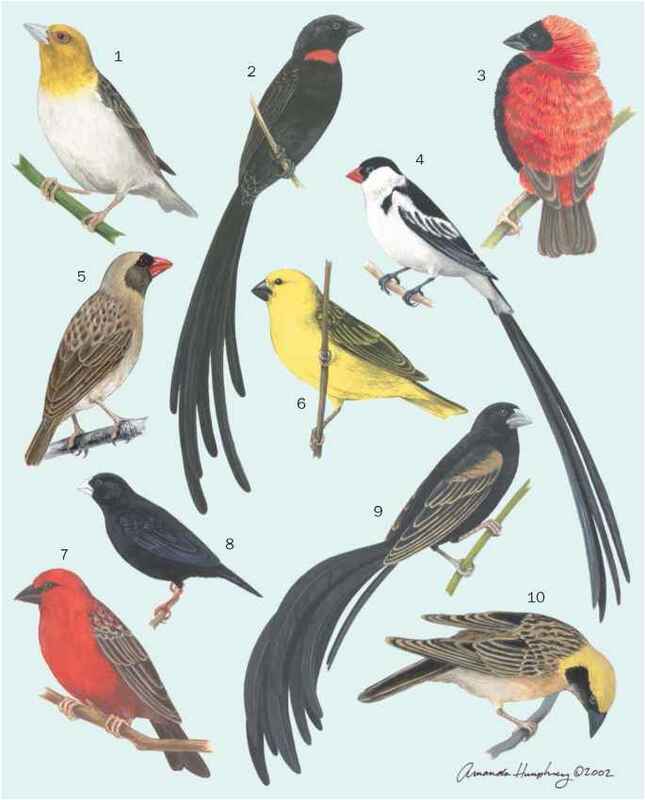 They are highly social birds, particularly during the non-breeding season when they aggregate into flocks, often with other species of finches. In areas where the ranges of the common redpoll and the hoary redpoll (Acanthis hornemanni) overlap, such as northern Norway, the two species may form mixed breeding pairs and produce hybrids of intermediate appearance. Common redpolls feed on grains and seeds, particularly favoring birch seeds. A stand of winter weeds visited by a flock of these birds is a scene of feverish activity as they tear dried flower stalks apart and then drop to the ground to pick up the seeds. Common redpolls are somewhat nomadic in their local breeding. If the local supply of birch seed is abundant they may settle in numbers. After raising their first crop of fledglings, they may move elsewhere to exploit another abundant resource of birch seeds. Their nest is a neat cup of woven grass, moss, and twigs placed in a fork of a willow branch. The clutch is four to six pale green eggs incubated by the female for 10-11 days. The altricial chicks are brooded by the female. They are fed primarily by the female with some male assistance at times. Fledging takes place in 9-14 days.